"The critically acclaimed Game of Thrones® Live Concert Experience Featuring Ramin Djawadi will bring the world of Westeros to arenas across Europe starting in May of 2018. Additionally, due to popular demand, a second North American leg of the tour has been added for the Fall of 2018, giving fans the opportunity to watch in wonder as famed composer Ramin Djawadi leads an orchestra and choir performing music from all seven seasons of the iconic, Emmy® Award-winning HBO series. 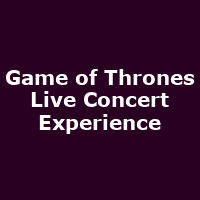 The new dates for the Game of Thrones Live Concert Experience Featuring Ramin Djawadi will include new music and footage from Season 7, as well a new custom stage design and mesmerizing visuals courtesy of state of the art video technology."